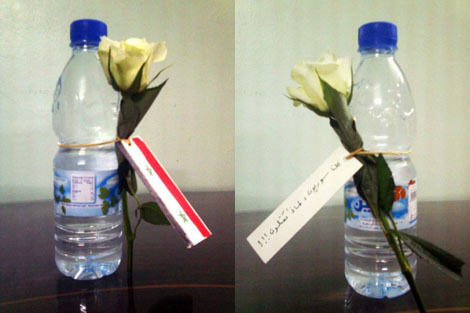 Water bottles tied to roses and notes, distributed by Daraya protesters in 2011. A letter in response to a Guardian column by Simon Jenkins. Media coverage of the conflict in Syria has been generally poor, but Simon Jenkins has crossed the line between poor analysis and outright offensiveness. The article displays all the usual signs of somebody who knows little or nothing about Syria, but nonetheless has an axe to grind or a pre-existing theory to apply. Discussing the Middle East as if the only things that mattered were the invasion of Iraq and ancient sectarianism remains the go-to approach for the ill-informed would-be expert. It’s impressive, in a sense, that Jenkins has managed to write as though Western countries, whose responsibilities to protect have been called on and ignored, are the cause of everything, whereas Russian imperialism and Hezbollah death squads are a sort of optional add-on. Where Jenkins surpasses the usual low standard of analysis is in his assertion that Syrians aren’t ready for democracy. He probably isn't aware, but the day the Guardian published his piece, the town of Daraya fell to Assadist forces. In 2011, the people of Daraya rose up in peaceful protest, calling for democracy and human rights, and were met with massacre. For four years they have been subjected to a starvation siege, barrel bombs and napalm, and they have resisted. In the midst of this they have organised their community democratically, and have been a symbol of the Syrian dream of freedom. How dare Jenkins speak of this heroic resistance in this way? Jenkins says that a thousand years of tyranny are better than a day of anarchy. It seems unlikely that Jenkins would make such a comment about white Europeans. Syria today suffers from tyranny and anarchy at the hands of the Assad regime. There are a great many Syrians who would give anything for the sort of comfort in which such flippant comments about tyranny can be made. If Jenkins doesn’t know anything about Syria—and he doesn’t—he shouldn't write about it. Syrians could do without the condescension of the ignorant.